Nakagawa, Yasuo. Hōshasen hibaku no rekishi: Amerika genbaku kaihatsu kara Fukushima genpatsu jiko made. Akashi shoten, 2011. Today’s radiation exposure protection standards have been dressed up in scientific garb to convince those compelled to live with radiation from nuclear power generation that radiation exposure is unavoidable and must be tolerated, and is an administrative means of politically and economically supporting the promotion of nuclear power generation (from the text). Using a vast amount of data, the author critically reappraises the history of radiation exposure, which has so far been written exclusively from a pro-nuclear power stance. What this hidden history reveals is that because nuclear power proponents prioritise financial gain, they calculate the harm to those exposed to radiation using a so-called ‘scientific’ mechanism that places an economic value on human life. The theory behind international radiation exposure protection standards has shifted from ‘tolerance dose standards’, which recognize the existence of ‘safe doses’, to permissible doses’, which are considered acceptable radiation doses — but which do not rule the influence of radiation on genes — for the average human. Public opinion has grown increasingly critical of nuclear power because of incidences of radioactive fallout and nuclear accidents. This has led to the introduction of ‘risk-benefit’ models, wherein the risk of radiation exposure is permitted in light of the social and economic benefits of nuclear power, and ‘cost-benefit’ models, wherein human exposure to radiation is allowable if the costs required to reduce such exposure exceed the benefits (i.e. the financial profits), or else if the risk of radiation is lower than otherwise acceptable risk. The theory of tolerable risk places a monetary value on human life and foists the risks on those who are in societally disadvantaged positions. It was developed through collaboration among pro-nuclear power organisations such as the International Commission on Radiological Protection (ICRP) and the United Nations Scientific Committee on the Effects of Atomic Radiation, acting under American leadership. The data from the Atomic Bomb Casualty Commission survey carried out in Hiroshima and Nagasaki entirely under American direction, surveyed only biased population groups and was statistically insignificant. Yet it was cited as a scientific basis [for the theory of tolerable risk]. What we learn from this history is that once there is a threat to the pro-nuclear power position, its proponents mobilise their international and scientific authority and this results in the release of an ICRP recommendation: this happens over and over again. Dealing with matters in accordance with the international radiation protection standards does not prevent increases in radiation exposure, especially to those in a physically or socially disadvantaged position. The author argues that we must not rely on powerful international scientific bodies, but must work independently toward lowering radiation protection standards. In the sections added following the Fukushima nuclear accident, the author explains the unsuitability and limitations of basing radiation exposure measures in Fukushima on the ICRP recommendations. In addition, he compares Fukushima to Chernobyl and looks at independent movements in the new sections. This book, released in 2011, is a revised version of A History of Radiation Exposure, published originally in 1991. The earlier edition provided evidence that our present radiation protection standards were arbitrarily laid down by proponents of nuclear power. Though published twenty years ago, it takes the approach — one that is considered necessary today — of examining the arbitrariness and cultural contingency of science. However, there has been little further research in this area, and though there have been other incidents the past, the Fukushima nuclear accident is considered ‘unprecedented’. In other words, insufficient use has been made of the research provided in this work, which has also perhaps been forgotten. This work is worth consideration whenever thinking about present international systems, radiation exposure countermeasures, as well as our own future individual actions concerning nuclear power. 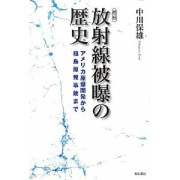 Note: “Fukushima and Radiation Exposure” is a compilation of discussions and reports from Kagaku gijutsu mondai kenkyukai, “Genbaku chōsa no rekishi o toinaosu,” March 2011. See also Sasamoto Yukuo. Beigun senryōka no genbaku chōsa: Genbaku kagaikuni to natta Nihon. Shinkisha, 1995.